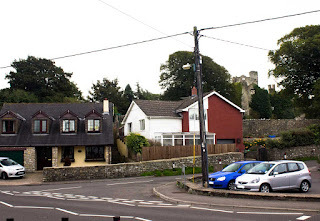 Boverton Village, near Llantwit Major, has stood since the time of William the Conqueror (1028-1087). 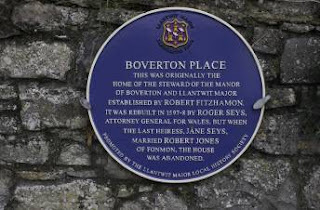 The main point of interest these days is the ruins of Boverton Manor also known as Boverton Castle, that was built by Robert Fitzhamon, a 12th century Norman conqueror of Glamorganshire in South Wales. 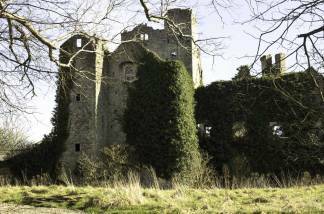 During the reign or Richard 1st the manor house was owned by the Earl of Gloucester. His daughter Hadwisa went on to marry Prince John and it is rumoured that this union lead to something quite sinister in the Manor that was witnessed hundreds of years later. Boverton Manor (left and above)is rumoured to have a ghost called the "Black Lady" who terrified some workmen during the early 19th Century. The ghost was dressed in black mourning clothes (hence the name Black Lady) and believed to be the restless spirit of Hadwisa, estranged wife of King John. He had divorced her and banned her to exile in the Manor house. However, still being in love with him, she lived a sad and pitiful existence there for the rest of her days, and it was her forlorn appearance made itself known to the workmen along with the sound of her mournful sobs. It was later rebuilt in the 17th Century as a fortified manor house by Roger Seys who was the attorney general of Wales, but then fell into decay. Boverton Manor is currently fenced off and can only be seen from the road outside, but it is well worth just standing there and soaking up some of its history. There have been no reported sightings of a ghost there in recent years, but that's not to say that the Black Lady won't appear again.